High-quality German-engineered Schmeisser Products available at dealer prices! 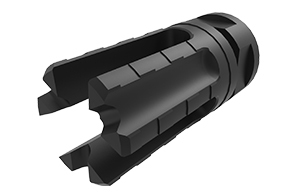 Schmeisser’s NoFlash Flash Hider w/Glass Breaker system provides a high-performance flash hider for true anti-glare shooting and defeats safety/security glass on first contact with little force. 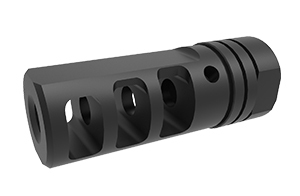 The Schmeisser NOREC® Compensator, with its vertical ports and 45 degree holes, is designed to decrease recoil and muzzle climb. Achieve a faster and more accurate shooting experience either in semi- or full-auto. 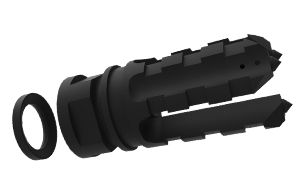 High-performance flash hider for true anti-glare shooting, suppressor compatible. 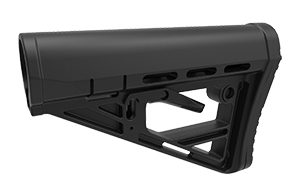 Features a “no rattle” mechanism that reduces noisy play between the buffer tube and buttstock for a strong hold when you put your rifle to your shoulder. 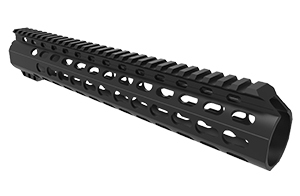 The Schmeisser lightweight Drop-In Slimline Keymod Handguard easily mounts on the gun without any screws or tools, and remains rock solid without any gaps. The slim body securely fits in your hand to ensure ultimate grip and control. The Schmeisser lightweight Free Float Slimline Keymod Handguard lets you mount an array of products exactly where you need them without the weight and bulk of unused rail space. Requires a 1 1/4 Standard or 32 metric size wrench. 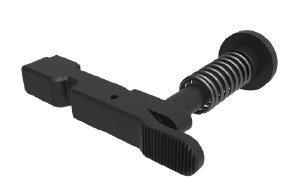 This M-Series/AR-Series Carbine SOLID multi-wire buffer spring is German engineered to provide a more fluid motion that makes it quieter and reduces felt recoil. 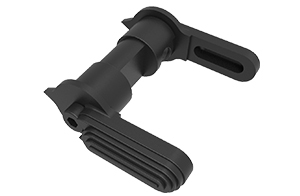 It is virtually unbreakable, but even if it should break, simply insert the pieces into the buffer tube and your rifle will continue to operate. The M-Series/AR-Series Carbine Buffer prolongs the lifetime of the receiver. 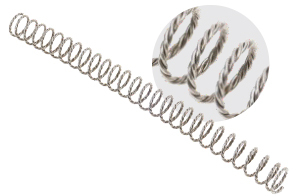 We recommend use in combination with the SOLID Multi-Wire Carbine Buffer Spring. 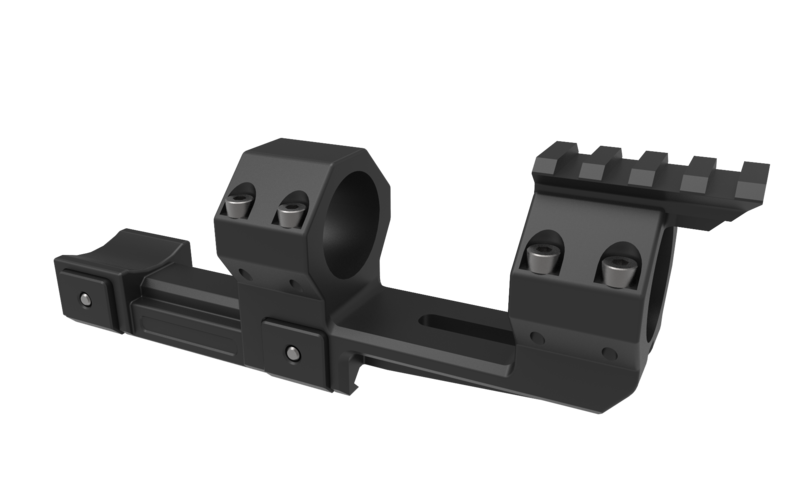 One-piece SMP cantilever scope mount with integrated 30mm rings. Off-set design gives the extra clearance needed for large or long eye relief scopes. 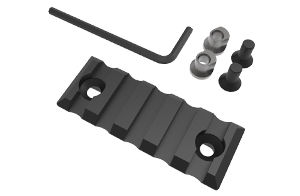 Each top ring strap is secured with four Allen screws to prevent slippage. 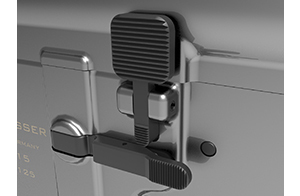 Spring-assisted steel brackets hold tightly on any Picatinny receiver rail. Robust, one-piece ambidextrous charging handle lever without cogs for an absolute hassle-free operation even in the harshest environments. 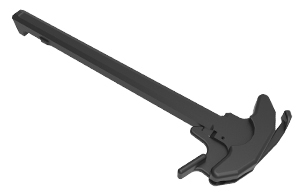 Ambidextrous drop-in charging handle lets you charge the rifle equipped with the large optics from either side of the receiver. Add Picatinny rail sections to Keymod handguards. 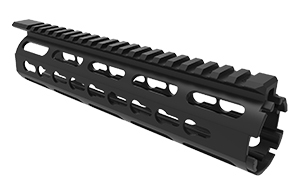 Aluminum rail segments fit onto Schmeisser and all other Keymod handguards. Includes mounting hardware. Available in 3/5/9 slots. After extensive tests with different operators, Schmeisser created a no-nonsense, highly ergonomic, ambidextrous safety. The Schmeisser ambidextrous drop-in safety selector is full-sized and designed to operate either right or left handed. 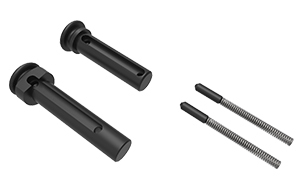 The Schmeisser extended bolt catch is German engineered to last. 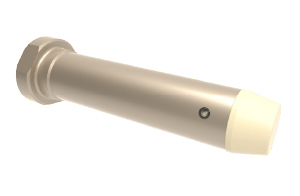 The extended release lever enables quicker magazine changes. The Schmeisser extended pivot and takedown set facilitates easier maintenance and repair operations. The Schmeisser enhanced triggerguard expands the trigger well to facilitate shooting with gloves in tactical or cold weather operations. 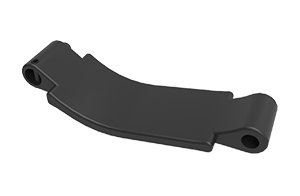 The Schmeisser ambidextrous extended magazine release allows for improved firearm handling. Doesn’t require modification of the firearm. Ideal for left-handed shooters, or when shooting from the offhand. Large, waterproof anti-slip neoprene mat covers the top of your table to protect your gun’s finish during cleaning and maintenance. Washable in washing machine and rolls up for easy storage. 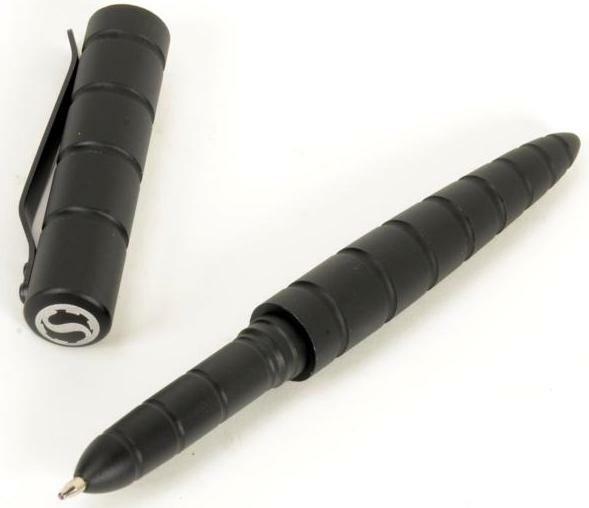 Schmeisser Tactical pen is a ballpoint pen and self-defense palm stick all-in-one. This tactical pen can write underwater and is allowed to be carried on airplanes. 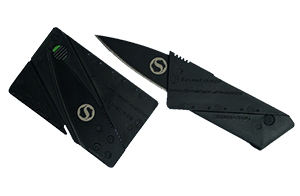 The credit card sized Schmeisser back-up knife is your everyday carry knife that fits comfortably into your wallet.